Muktesh Pant is the chief marketing officer of $ 13-billion Yum! Brands’ international division, Yum! Restaurant International. It is the world’s largest restaurant company with 35,000 restaurants. Muktesh Pant belongs to Kumaon. He did his schooling at Saint Joseph’s School Nainital. His mother, Shivani, is a famous Hindi novelist. The only son and the youngest of four children, Pant excelled in school. He wanted to study chemistry so he took the entrance exam and joined the IIT – Kanpur. Muktesh got his M. Tech. degree in 1976 in Chemical Engg. At the end of his fourth year at IIT, he went to Nocil for industrial training. “That’s when he realized that engineering by itself would get him nowhere. Engineers are given a pat on the back and the best employee award, while it’s the marketing and finance guys who got good money”. So, when some months later, Hindustan Lever came to the IIT campus to recruit engineers, Muktesh Pant asked them if it was possible to accommodate him in the marketing department. Pant wasn’t too hopeful of getting a positive response and had already secured admission at IIM – Ahmedabad, But Levers invited him to Mumbai for another round of interviews. It was unusual in those days to appoint someone in the marketing department who didn’t have an MBA degree, but Pant clinched it in the interview. That was the end of chemistry. Muktesh (Micky) Pant spent 15 years in the company, from 1976 to 1991. According to Pant “Hindustan Lever, is the most pre-eminent company in India. It ingrained in me the very best management practices”. In 1991 he moved from Hindustan Lever to Pepsi. Pant joined Pepsi for a four-year stint in 1991, where he headed the exports division, and later its bottling operations. He took another leap in 1996 when he moved from Pepsi to Reebok as its country head in India. He helped found Reeboks’ India office, and eventually became the Chief Marketing Officer of Reebok. In a market where global brands like Adidas, Nike, Lotto and Puma were jostling for consumer attention, Pant carved out more than 50 per cent share of India’s premium footwear market for Reebok. Then he moved to Boston as Reebok’s global brand manager. 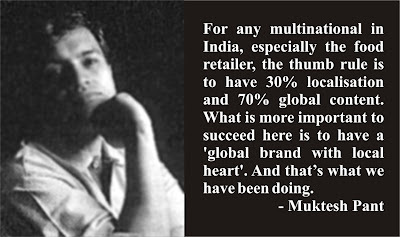 He was employee number one at Reebok, India, and helped build the company and its brand in India. Mr Pant, who came close to the top spot at Reebok, threw up a high profile marketing job, for the sweat and risk of an entrepreneurial venture, which was close to his heart. In 2004 Muktesh Pant has resigned as CMO of Reebok in order to pursue his life-long dream of establishing a yoga business that connects him to his roots in India. After following his dream of Yoga start-up, Muktesh Pant returned to the big corporate world as Chief Marketing Officer in Yum! Restaurants international divisions in mid 2005. Owner of leading restaurant brands like KFC, Pizza Hut, Taco Bell and Long John Silver’s. In his new role as worldwide chief marketing officer, Pant is working out in the company’s Dallas headquarters. A division of Yum! Brands Inc, a leading restaurant company with more than 33,000 restaurants in over 100 countries and territories, Yum! Inc, is the second-largest food franchiser in the world, after McDonald’s, in terms of sales. .For Mr Pant, the move from Reebok International to Yum! would mean moving from a single-brand company to a multi-brand environment. He is among a handful of Indians who have earned their mega-spurs on home soil.